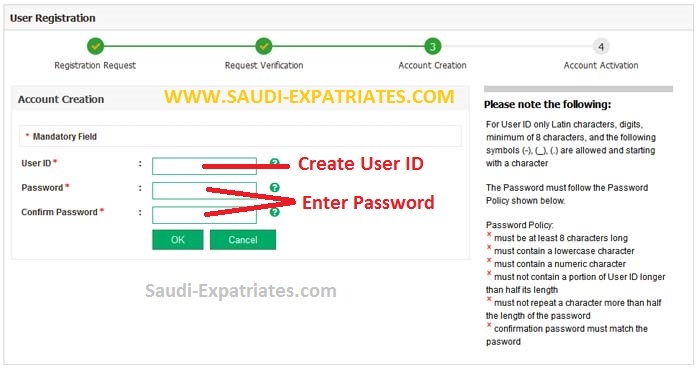 The procedure for MOI Saudi Absher Service Registration is modified from the earlier one as we explained in this article "Register for MOI Abhsir". As the Ministry Of Interior Saudi Arabia upgraded its official website portal. Visit Ministry Of Interior website www.moi.gov.sa English version. Click on "New User". - "Identification Number" is your Iqama or Muqeem number without Iqama number you cannot make account. - In "E-Mail Address" you can enter your correct and working Email, Then re enter your mail in "Confirm E-Mail Address". - Default "Preferred Language" is Arabic, You can choose it as English. 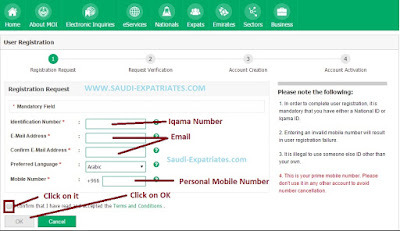 - Enter your "Mobile Number", It should be your personal number, Mobile Number is very important to access your account any time from anywhere. - Then check the little box beside "I Confirm that I have read and accepted the Terms and Conditions", Click on "OK" button. 2. Now you will receive SMS Code on the mobile number you entered, Your page will be redirected to another page as you can see in below image. - Enter "Activation Code" as you got in SMS code, Enter "Identification Number" its your Iqama Number you entered earlier, Now Click "OK". 3. Now you can see another page asking you to enter details like "USER ID", "PASSWORD" and "CONFIRM PASSWORD", Click on "OK". 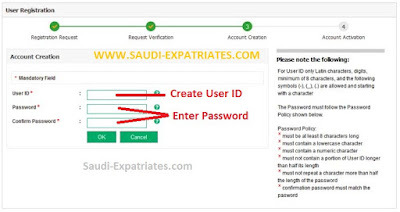 - You can enter your "USER ID" as you like, You can also use "-", "_" and "." in between your user id. - "PASSWORD" and "CONFIRM PASSWORD" should be same, It is compulsory to use "Number", "Lower Case letter" and it should be more than 8 characters.